It's a good day for fans of caged simians. First, the dastard who stole SpongeBob the monkey from Chessington has been sentenced. Monkey rustler Marlon Brown will serve a year behind bars himself after what the judge described as "an act of devilry". In the event the monkey was recovered but it was traumatised and still is traumatised. You showed no remorse. SpongeBob has since been moved to Battersea Zoo. He infrequently updates his blog. Three western lowland gorillas will live in the enclosure: Bobby, a 23-year-old male; and two females, Zaire, 32, and Effie who is 13. Effie, who has recently arrived from Leipzig Zoo, has already had two babies. 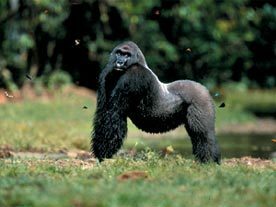 With her slim physique, her keepers have dubbed her "the Kate Moss of gorillas". Are we right in thinking that punchlines involving cocaine and silverbacks just aren't there?